My mother really loved her son-in-law, and she always tried to make him some of his favorite dishes when she knew we were visiting. I don’t remember when she first found this recipe. It wasn’t handed down to her from her mother, like a lot of our recipes were. She probably found it in a magazine somewhere and just decided to try it one day when we were coming to visit. Ben always made sure to go over to the kitchen counter when we got to my mother’s to see what goodies she had baked for us. 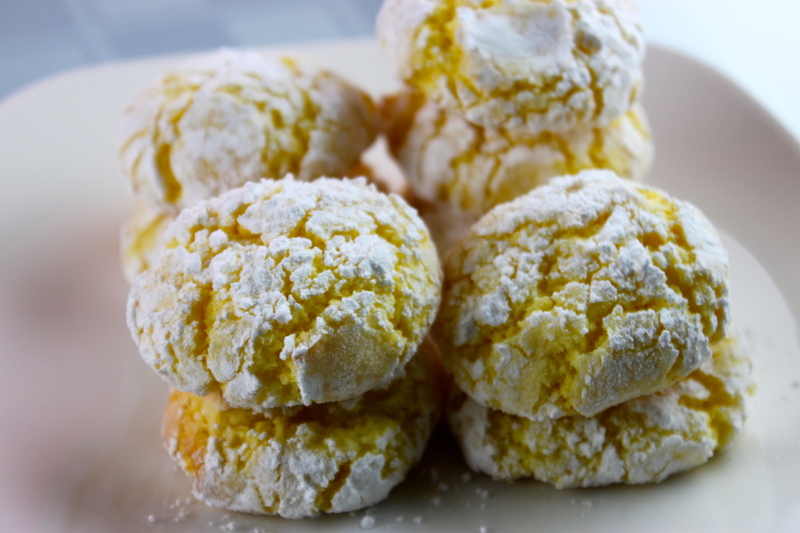 And on one occasion, there were these yellow crinkled up cookies dusted with powdered sugar cooling on her old wire cookie racks. Who knew they’d turn out to be one of his very favorites? And from that time on, we’ve always made these cookies at Christmas. And other times of the year, as well. Ashley has been my official lemon drop cookie maker, though, because they’re a bit messy to make, since you have to mix them with your hands. And she really didn’t mind. At least I don’t think she did. Except now that she has her own home, who’s going to make them? Any volunteers before I have to do it? So in our newest tradition of presenting weekly (hopefully) family recipes, here’s the super easy and quick lemon cookie recipe! Mix ingredients together by hand. Literally. Because they really won’t mix together well any other way. You can start out with a spoon, but once it gets mixed good, you gotta get your fingers in there! It’s also easier to coat your hands in flour or powdered sugar when you’re doing them, so you won’t have such a mess when you’re done! After they’re mixed, roll in 1 – 1 ½” balls, dip them in powdered sugar, and place on a greased cookie sheet about 1 – 1 ½” apart. Make an indentation in the middle with your thumb, or whichever finger your prefer. We’re not doing fingerprints! Bake in preheated 350 degree over 8-10 minutes until done. Cool on a wire rack, and store any that are left after they family grabs them in a sealed container. If they last long enough and start to get a little hard, put a slice of white bread in the container with them, and you’ll be amazed at how moist they become again! Let me know how you like them! You can also use strawberry cake mix, or chocolate (add vanilla in place of the lemon juice) but I really like these lemon ones the best!